Sugr puts a unique spin on the wireless speaker. Sugr makes the exposed front driver part of the speaker’s overall design statement. On my review unit, the black woofer stood in stark contrast to the cherry finish. That lone driver is a 3.0-inch, full-range neodymimum-magnet driver with 10 watts of amplification. It’s a ported design with the speaker’s port located on the rear. You set the cube’s volume with a silver on/off knob just above the rear port. 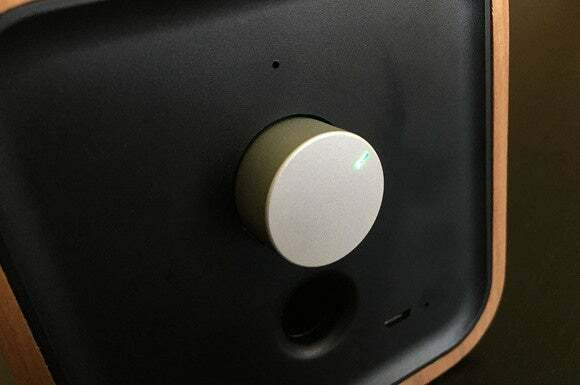 The volume knob does double-duty as the system’s main on/off switch. Just looking at the Cube, you wouldn’t know that it has a few tricks up its sleeve. While they may seem gimmicky at first, you quickly realize they are simple and practical. For example, the Cube’s surface and its distinctive, rounded edges serve a functional purpose. Simply place your hand on top of the unit and the Cube will start to play music. Tap the top again to pause. Tilt the Cube on its rounded edges 45 degrees to the left to go to the previous song. Tilt to the right and advance to the next. 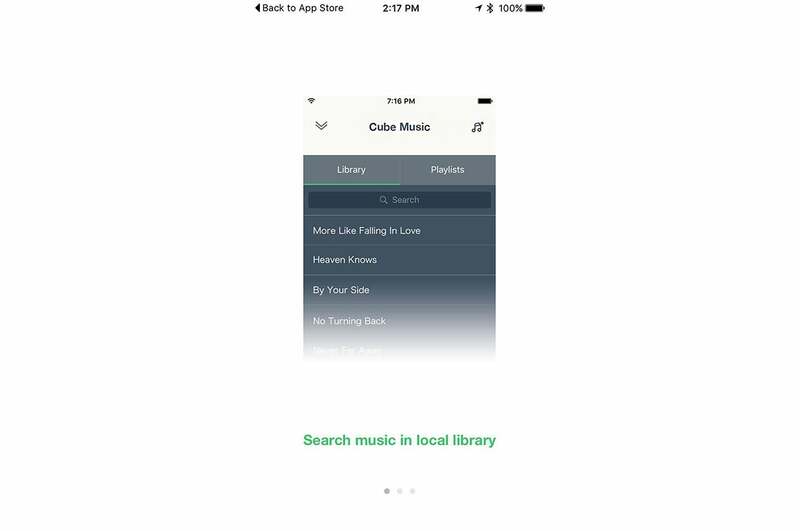 The Cube isn’t held hostage by any mobile app for even basic functionality—it can eve store its own music. The Cube's rear panel features the main volume knob, plus a port opening. When it comes to wireless connectivity, many vendors opt to go with Bluetooth; but in my opinion that introduces functional limitations and frustrations. I was therefore happy to see that the Cube supports Wi-Fi, albeit on the 2.4 GHz frequency band only. There are so many advantages to Wi-Fi-enabled speakers including better range, greater bandwidth, and higher-fidelity audio streaming. The Cube supports AAC, ALAC, APE, MP3, WAV, FLAC, and more, though you won’t hear all the benefits of high-resolution audio here. Best of all, with Wi-Fi enabled speakers like the Cube, you have the ability to use network protocols such as Apple’s AirPlay and DLNA, so that you can stream music from your computer or music server. The Cube has a unique way of pairing with your smartphone. It handshakes with your iOS device by emitting a series of sounds that transfer all the Wi-Fi settings the Cube needs from your phone. I found the process to be flawless. In a matter of moments, the Cube was on my network and I could see it as an AirPlay speaker and from the Cube app. You can name your Cube speaker, too. Cube says that in the near future, they will be offering an update that will allow you to use two Cubes as a wireless stereo pair. A Sonos-like multi-room set isn’t supported, but Sugr says you can use a third-party App like WHAALE to set up multi-room functionality with several Cubes. I was nether given a second Cube nor the beta of this firmware to test. The Cube looks as beautiful as its sounds. From the Cube app, you can see the network the Cube is connected to along with its signal strength and battery life, which is said to last about 24 hours (a claim I did not evaluate). The Cube app also gives you lots of different music options. Spotify Connect will be of interest to many, as the Cube appears as a speaker right within the app, but you can also stream from Pandora, Amazon Prime Music, Google Play Music, and several other services. You can also use the Cube as a bedside clock radio, with a ringtone or music to wake up to. When an alarm goes off, and you want to turn it off or snooze it, you don’t need to find your smartphone, just tilt the cube 90 degrees onto its side. No fumbling for your phone or trying to figure out which button is snooze. It doesn’t get any easier or smarter. This feature is great! There is also a “Relax Radio” channel that will play various environmental sounds intended to smooth and relax you. It’s a good option for some white noise. As long as you don’t play the chirping birds track over and over you’ll be fine. The Cube lets you take your music on the road, too, as it comes with 4GB of onboard memory. Simply launch the Cube’s app, select the songs you want to transfer and bingo, you’re done. It’s fast and efficient. 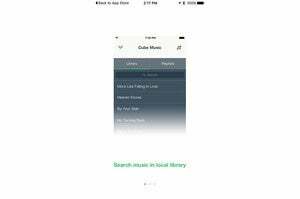 Once music is loaded onto the internal memory, you can group songs into playlists. Creating and editing playlists is as easy as using the Music app on an iPhone. Now here’s the cool thing: Once music is loaded onto the Cube, you can use it without a smartphone to play songs you’ve loaded onto its internal storage. Songs will play in the order you’ve loaded them and you can advance songs by manually tilting the Cube. It worked like a charm in my tests. If you’re listening to music from the internal storage and turn the cube off, your music will start playing again when you turn it back on—even if there’s no smartphone around. Like the much larger Mohu BeBox that I tested last year, I love speakers that provide you with the option of app-free functionality. A sound as smooth as its looks? It’s time for a confession. I tend to cringe when I look at speakers of this size (it’s the audiophile in me). Audio quality won’t be a strength (it’s the laws of physics). So the question becomes how bad are the design trade offs. Thankfully the Cube wasn’t bad. In fact, it defied some of my expectations. The Cube did a decent job on “Scherzo for X-Wings” from the The Force Awakens soundtrack. I liked the way the Cube presented the energy and attack of the piece. Certain instruments fared better than others, however; brass instruments, for example, had some coloration—especially off axis. Percussion instruments fared better. Tilt the Cube 45 degrees to advance or skip back to the previous song. Overall, the Sugr performed better with rock and pop music. And that’s probably more in line with Sugr’s target audience anyway. Lorde’s “Royals” has some bass notes that can only be appreciated on a good, revealing audio system. While I’m not a big fan of artificial bass boosting, it worked in this case and helped covey some of the artistic emotion (though not all the detail). I played several Adele songs, including “Skyfall.” An overly warm (euphoric) presentation in the midrange was consistently present. I think many buyers will like that voicing. For me, however, the overly warm sound became too thick—almost syrupy—at times. I noticed it most with songs like U2’s “Song for Someone” where the opening guitar’s body sounded a bit veiled and didn’t breathe as much as I’m used to. 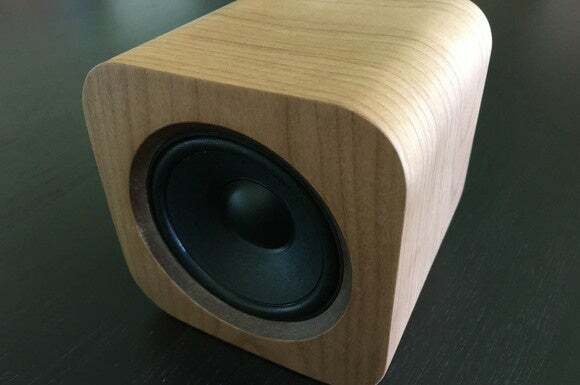 The Cube is not in the same sonic league as the Riva S, but its surprisingly for a speaker of this size. The diminutive Cube strikes a, ahem, sweet spot. 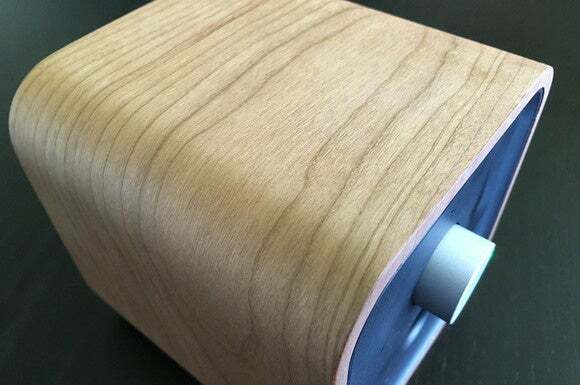 It's beautiful to look at, and its support for AirPlay, DLNA, and Spotify Connect streaming--in addition to its own storage--are worthy of your attention. Marry that with its unique tactile elements and you have a small, versatile speaker that will satisfy many. Whether that satisfaction is worth its $229 price tag is something only you can judge best. 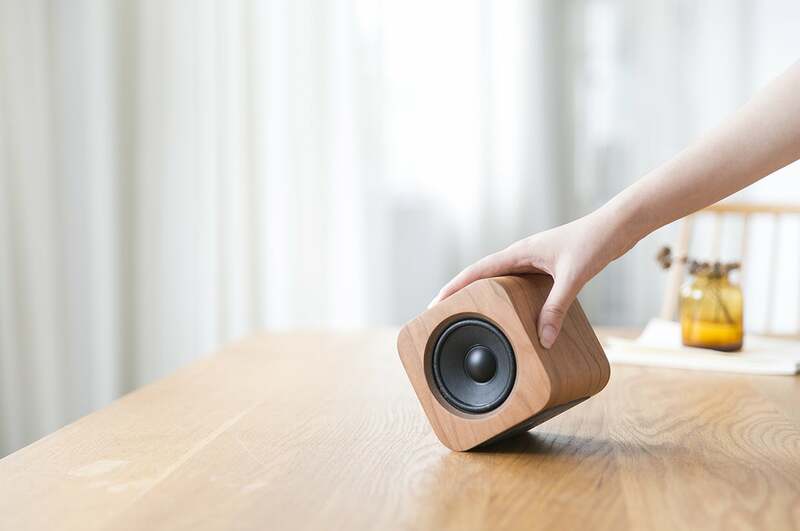 The Cube by Sugr is billed as the world’s first portable Wi-Fi speaker with Spotify. That may be the case, but I found the Cube to be much more than that. I found it to be a wireless speaker marrying form and function—one that doesn’t need a smartphone or app to satisfy your musical cravings.